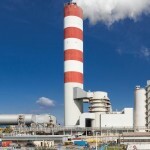 Canadian power station fits FGD for 25 more years of service and constructs a new chimney with PennguardTM lined flues. The public utility for the Province of New Brunswick in Canada, NB Power, operates a mix of fossil fired, nuclear and hydro generating stations. 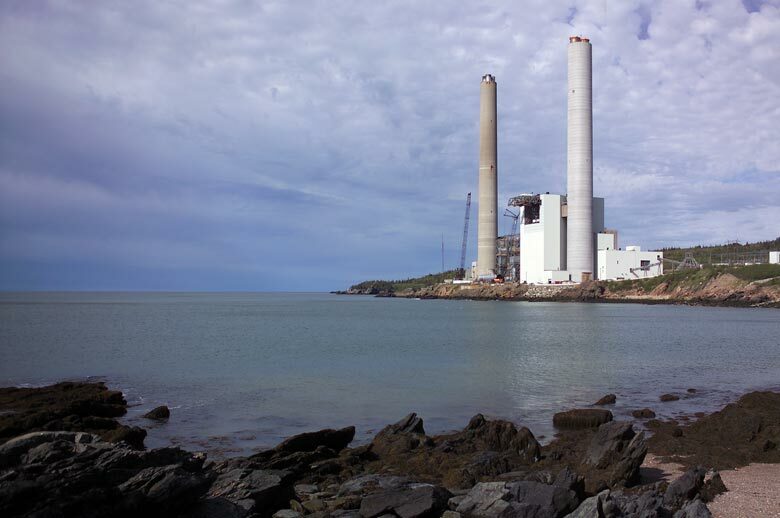 One of the largest stations in NB Power’s fleet is the 3 x 350 MW oil fired Coleson Cove Generating Station near the Atlantic coastal town of Saint John. With the price of oil increasing at an unpredictable rate, NB Power had to plan for the future role of the station, keeping in mind expected energy needs and economics as well as emissions regulations. Based on a study of many different options, NB Power decided to switch to a lower cost fuel, while also fitting state of the art emissions reduction equipment and building a new 183 m high chimney. The Coleson Cove station plays a strategically important role in NB Power’s generating fleet. The station is a very flexible generator, which can easily follow fluctuating power demands. In addition, the station offers back-up capacity to NB Power’s large nuclear station as well as to its hydro capacity, which has low availability in winter. To convert the Coleson Cove station into a low cost generator, NB Power decided to make the station suitable for firing Orimulsion, a more economical fuel, which is essentially a mix of 70% bitumen and 30 % water. 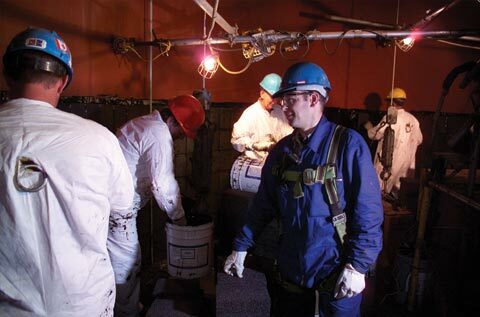 Like heavy oil, Orimulsion contains sulphur and as a part of the conversion project, NB Power also decided to install highly efficient flue gas desulphurization (FGD) plants. In addition to the FGD absorbers, the station has been equipped with wet electrostatic precipitators (wet ESP’s) to minimize emissions of sulphur trioxide and fine particles. Directly downstream of the twin FGD absorbers and wet ESP’s, the Coleson Cove station has also constructed a new, 183 m high concrete chimney. The new chimney will operate as a “wet stack”, carrying treated, non-reheated flue gas. The two, 7.0 m diameter carbon steel flues in the new chimney are internally protected by the PennguardTM Block Lining System. 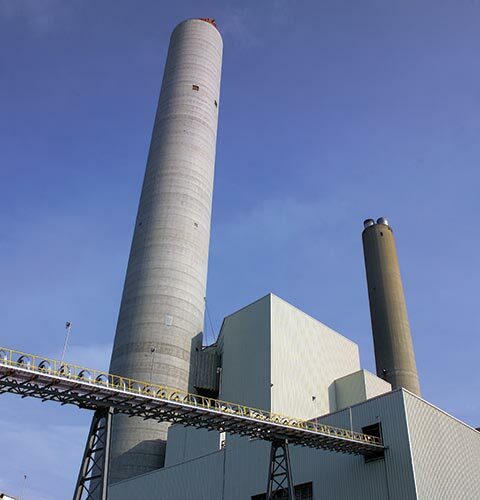 The new FGD chimney of Coleson Cove Generating Station will be operated as a “wet stack”; after passing through the wet limestone FGD absorbers and the wet electrostatic precipitators, the flue gas enters the chimney as a water saturated gas stream. The flue gas temperature of 60 °C is also its water dewpoint temperature. The operation of “wet stacks”, without any mechanism for heating the gas stream above its water dewpoint, is often economically attractive. However, wet stacks do carry a potential risk for the environment around the power station: liquid condensate formed on the internal walls of the chimney flues can be “reentrained” into the gas stream and deposited near the chimney as acidic droplets. 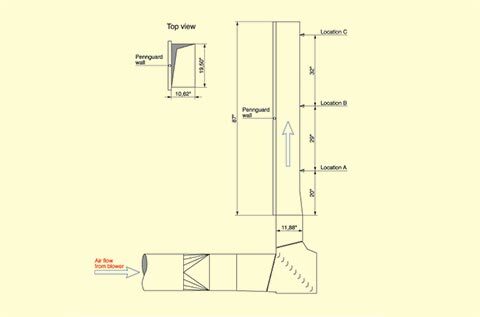 The use of thermally insulating PennguardTM linings in the chimney flues can help to reduce the temperature loss of the gas stream as it flows up to the top of the chimney. As a result, the amount of condensate formed in the flues can be significantly reduced. This advantage can be especially important during start-ups, when the chimney and its flues are still cool. As the gas stream starts to flow through the chimney, there will be an initial period of high condensate formation. This high condensation rate will last, until the internal surface of the flues has warmed up to its final operating temperature. At Hadek’s request, Exponent Engineers from Menlo Park, California, have performed a modeling study to show, how the use of PennguardTM lined flues would reduce direct condensation during start-ups. 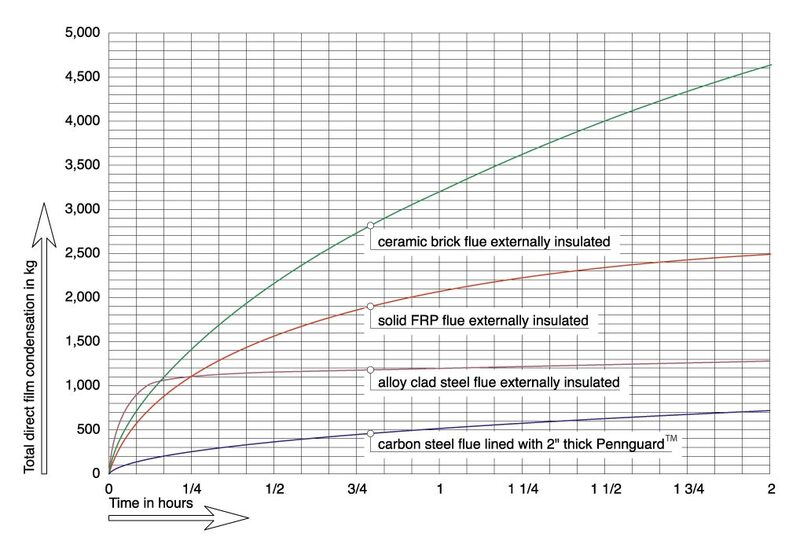 Figure 1 shows a comparison between the behaviour of PennguardTM lined steel flues and that of several other design concepts, during the initial 2 hours of operation. 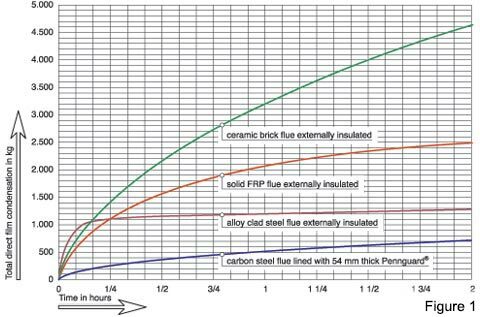 As shown, the amount of direct film condensate formed in the PennguardTM lined steel flue is significantly lower than for any of the other designs. Even though the use of a thermally insulating PennguardTM lining will help to reduce the amount of condensate formed in the chimney, the presence of a thin film of condensate has to be expected during non-reheated, wet stack operation. To learn more about the expected behaviour of this condensate film on the slightly textured surface of a PennguardTM lining, Hadek approached the Alden DynaFlow laboratories in Holden, Massachusetts. Alden DynaFlow has over 20 years of experience in testing and evaluating materials and design geometries for FGD ductwork and wet stacks. 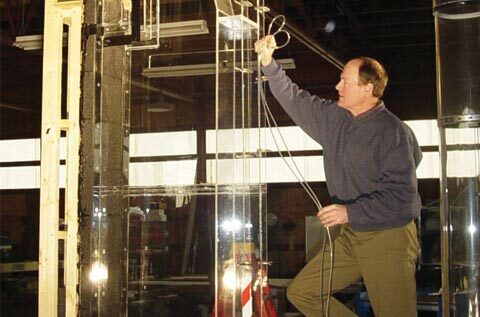 To test the PennguardTM Block Lining System, Alden constructed a vertical wind tunnel, where a 2.5 metres high, PennguardTM lined panel could be exposed to a range of gas velocities. 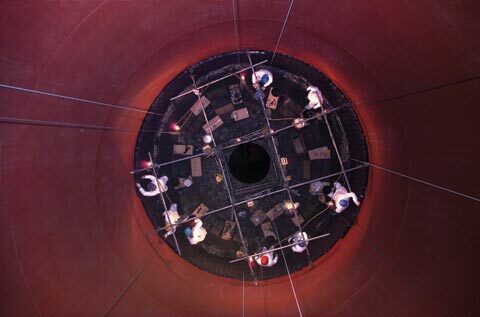 The other three sides of the wind tunnel were constructed of plexiglass, which allowed the test team to observe the behaviour of a water film on the lining, at different velocities. Based on their test program, which is described in a detailed report, Alden concluded, that at flue gas velocities of up to 65 feet per second (19.8 m/s), a condensate film will drain off a PennguardTM lined surface reliably, without significant reentrainment. For newly designed, PennguardTM lined wet stacks, Alden recommends 60 feet per second (18.3 m/s) as a safe gas velocity. Alden also found, that the textured surface of PennguardTM Block has an advantage for wet stack operation. This slight roughness creates a capability for the lining system, to hold on to condensate films better, even at greater film thicknesses. This property, which is known as “wetting behaviour”, can be important during some specific operating phases, such as start-ups or load reductions, when the condensate film thickness is usually greater. 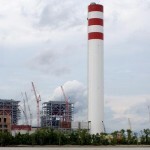 The new chimney of the Coleson Cove Generating Station was built by Hamon Custodis-Cottrell Canada. When planning for the erection and lining of the two steel flues, the contractor had to deal with some specific challenges. First of all, there was only limited space available around the chimney construction site. 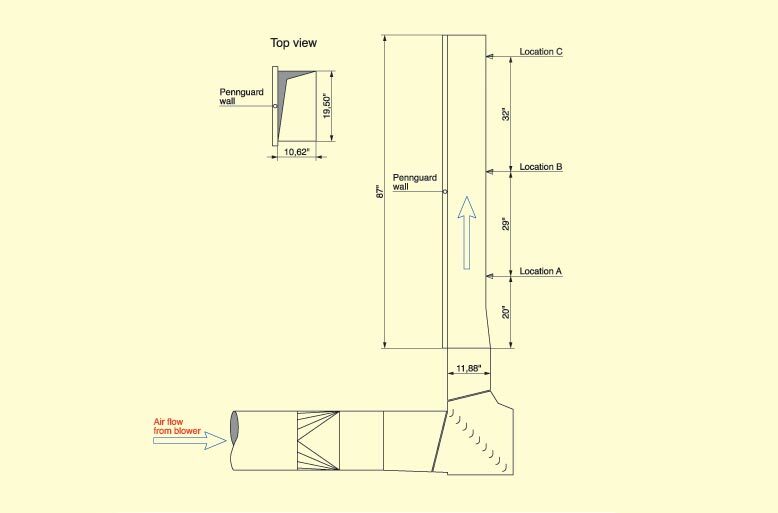 In many cases, it is cost effective to build chimney flue cans, which are then lined with PennguardTM at ground level, prior to the erection of the steel flues. However, in this case, Hamon Custodis decided to install the steel flues in the concrete windshield as quickly as possible, so that all the lining work could be performed from a moving platform in one continuous process. This approach helped to minimize the size of the work area required at ground level. PennguardTM lining / wet stack test rig, used by Alden. Second, the climate conditions at the Coleson Cove site, which is on the shore of the Bay of Fundy, are challenging even in spring and summer. Below freezing temperatures can occur well into spring and sunny weather can quickly be replaced by fog and rain, anytime. The contractor addressed this, by closing off the top of the chimney and placing sufficient heating capacity at the base of the chimney, to heat the steel flues inside and out. This created a stable working environment, where the temperature was usually between 16 and 20 °C. The installation of the PennguardTM Block Lining System was performed by teams of brick layers from the Province of New Brunswick. On average, a team consisted of six brick layers and one helper on the platform, with two more helpers at ground level.